Feel like delivery food tonight? If you order on the popular websites Seamless or GrubHub, the kitchen cooking your dinner may not be what it claims to be. The I-Team checked 100 of New York City's top customer-rated Seamless and GrubHub restaurants and found slightly more than 10 percent of the kitchens were ghosts, meaning they had names or addresses that failed to match any listing on the city's database of restaurant inspection grades. Julie Menin, the city's Consumer Affairs Commissioner, said her office has also found ghost restaurants using unregistered names and false addresses. She believes some of the Seamless and GrubHub ads may actually be fronts for unregulated kitchens. "Some people might be illegally operating from their apartment, from their home, and delivering to people in complete contravention to department of health regulation," Menin said. A phony restaurant called "Really Chinese" is a prime example of the delivery shell game. According to a GrubHub ad, "Really Chinese" is located at 235 E 31st Street. But when the I-Team went to that address, there was no restaurant -- just a residential brownstone with a sign on the door reading "private residence." And "Really Chinese" has no restaurant permit. 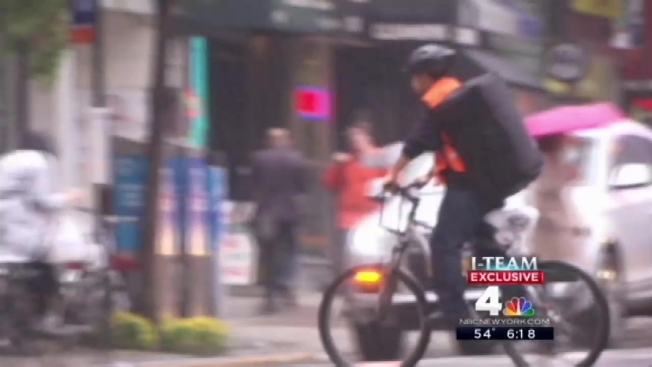 The I-Team ordered food and waited for the delivery worker. When he arrived, he said the food had been prepared at a restaurant four blocks away. But that restaurant is called “Abby Chinese. " According to Health Department records, “Abby Chinese” has a B grade, and inspectors have found evidence of rats, roaches or mice at Abby Chinese six times in the last two years. The manager of Abby Chinese, Gary Chen, admitted he opened the fake restaurant to keep up with other kitchens. He said it is common knowledge that restaurants on Seamless and GrubHub advertise under multiple unregistered names with multiple phone lines for the same kitchen. The practice allows a restaurant to increase the chances a consumer on Seamless or GrubHub will click on one of its menus. "When we have one line, it's hard to compete," said Chen. “We know how many lines some of the other restaurants have. It's an open secret." Michelle Jones, a restaurant consultant who helps keep kitchens in compliance with the law, says Seamless and GrubHub have no legal responsibility to verify names and addresses of restaurants, but the sites' may risk losing customers' trust. “Consumers need to be able to trace back where their food comes from in the event that they get sick,” Jones said. Seamless and GrubHub merged into one company in 2013. In response to the findings of the I-Team and the Consumer Affairs Department, the company has pledged reform, including cross-checking restaurants with the city's database of restaurant inspection grades. "We take the accuracy of our restaurant listings seriously," said GrubHub spokeswoman Abby Hunt. "We are partnering with New York's Department of Consumer Affairs to address the issue and remove inaccuracies." Hunt said GrubHub and Seamless have already taken down menus of phony restaurants identified by the I-Team. Anyone who spots an inaccuracy on either of the sites can email restaurants@grubhub.com or restaurants@seamless.com. And if you want to check out the restaurant you're ordering from, you can review inspection grades on the city's website. While some ghost restaurants are clearly breaking the rules, other kitchens operate in murky regulatory waters. The I-Team found a kitchen on 44th Street registered to a non-retail commissary operated by Green Summit Group LLC. The kitchen sold Latin food, barbecue and gluten-free meals from a least six different Seamless and GrubHub menus. None of the menu names appeared in the Health Department restaurant database because commissaries aren't considered restaurants and don't get grades. A spokeswoman for the Health Department said commissaries are not allowed to deliver straight to consumers. In an e-mailed statement, the spokeswoman wrote, "Should they continue selling directly to the public with their current permit, they will be sent an order to cease and desist immediately." Richard Scherer, an attorney representing the commissary, said compliance with health law is of utmost importance to the company. “We have begun the refiling process, which will result in a letter grade that is publicly available via the Department of Health’s database," Scherer wrote in an email.